Maria Pronchishcheva (Мария Прончищева, also known as Tatiana Pronchishcheva, 1710 - 23 September 1736) was a Russian explorer. In 1735 with her husband, Vasili Pronchishchev, went down the Lena River (from Yakutsk) on Vasili's sloop Yakutsk, doubled its delta, and stopped for wintering at the mouth of the Olenek River. Many members of the crew fell ill and died, mainly owing to scurvy. 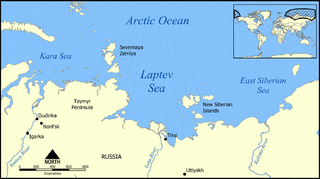 Despite the difficulties, in 1736, they reached the eastern shore of the Taymyr Peninsula and went north along its coastline. Finally Pronchishcheva and her husband succumbed to scurvy and died on the way back. Maria is considered the first female polar explorer. Maria Pronchishcheva Bay in the Laptev Sea is named after her. Maria Temryukovna was a Circassian Tsaritsa of the Tsardom of Russia and second spouse to Ivan IV of Russia.